I’m writing this post (or rewriting it from scratch in February 2019) for anyone who wants to know what the D.E. Hive is all about, or at least wants to know what I know about the D.E. Hive. It doesn’t seem to be too far off from the hive design I settled on myself. One of my hives wrapped up for winter, not that different from the D.E. Hive. I knew about the D.E. Hive early in my beekeeping. It was created by a guy named David Eyre. I read that it was the perfect hive for the Canadian climate. The bees that live in them supposedly never swarm and don’t need to be wrapped or insulated in the winter. But the cost of the hive was considerably more than what I’d pay for a normal Langstroth hive, so I passed on it and eventually made ventilation rims and moisture quilts for my hives which I suspect work just as well. I often mention The D.E. Hive when I talk about hive ventilation. I talk about hive ventilation quite a bit because a properly ventilated hive is a pretty important thing in beekeeping, or at least it has been for my beekeeping where I live on the island of Newfoundland. On the cold, wet, damp, windy island of Newfoundland. Ventilation is probably more crucial in the winter than any other time of the year because, as many beekeepers seem to say, it’s not the cold that kills the bees — it’s the moisture. 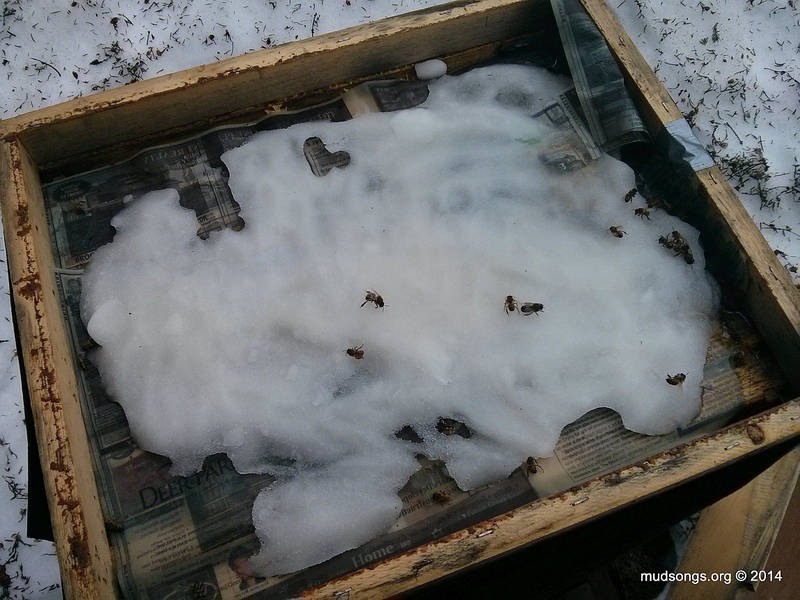 Cold condensation dripping down on the bees causes them to freeze and die. Cold damp bees are dead bees. It looked as if someone took a hose and filled the hives up with water. It was nuts. All that moisture came from the surrounding environment which was boggy and foggy and damp to the extreme. Moisture got into the hives and had nowhere to go because the hives weren’t well ventilated. I already had some ventilation rims that I used for summer ventilation. The rims sit on top of the inner cover and allow humidity to escape from the hive so the bees don’t have to fan as much to cure their honey and regulate the temperature of the brood nest during hot summer days. A well ventilated hive also reduces congestion within the hive and helps prevent swarming. All good stuff. One of my patented Mud Songs ventilation rims. After I discovered my horribly wet hives in Logy Bay, I stapled screen to the bottom of all my ventilation rims, filled them half way up with wood chips and essentially converted them into moisture quilts. Within a week they were all bone dry inside. Nice, warm, dry bees. They survived the Logy Bay winter because of those moisture quilts. Moisture quilts are magic. For many people, hard insulation over the inner cover is fine. But come January or February, if I find any moisture inside my hives, I immediately switch over to moisture quilts. They’re easy to make and cost me maybe $15 each. It’s worth it. So that’s how I keep my hives well ventilated in the summer (with ventilation rims) and in the winter (with moisture quilts). My hive ventilation methods, especially the ventilation rims, are similar to The D.E. Hive and for all I know, they’re just as effective. Ventilation for the hive is essentially provided by one of my ventilation rims with a larger box full of holes placed on top. Apparently it works well for insulation and ventilation all year round with the holes in the bottom ventilation rim blocked for the winter. The D.E. Hive also incorporates a heavy hive stand that doubles as a bottom board that is turned 90 degrees (relative to a standard Langstroth hive) so that the front entrance is parallel to the frames instead of perpendicular. The bottom entrance is reduced so it doesn’t go along the whole length (or front) of the hive. The frames are supposedly lighter and thinner too. I haven’t used a D.E. Hive yet because I’ve put way too much time into the design of my much more affordable hives that include my ventilation rims and moisture quilts. A single D.E. Hive would cost me at least $100 more per hive. Now if they produce twice as much honey as my Langstroth hives and the bees never swarm in them, then yes, that extra $100 is worth it. But right now I’m just too poor to even think about it. I’m not sure if the D.E. Hive is better or worse for beekeeping in Newfoundland than what I’m already using. I just don’t know. I’m not an authority on the D.E. Hive because I’ve never had one, I’ve never seen one in action, nor have I viewed any photos or videos about it. I don’t know why anyone, not even in Newfoundland where many of them are sold, hasn’t bothered to document such a highly regarded hive online, but there you go. Judging by how well they sell, though, my guess is they work well in Newfoundland weather. The D.E. Hive was originally sold by Bee Works. A version of it is sold in Newfoundland by G&M Family Farm. And that’s all I know about the D.E Hive. This entry was posted in Ventilation, Year 2019. Bookmark the permalink.